The horse is the most influential animal in the history of mankind. Early on, the horse was just another protein source for prehistoric man — but all that changed around 6,000 years ago when the first human dared to get on a horse’s back. Since then horses have enabled us to transport people and goods long distances, till and plant fields, wage war, and conquer new frontiers. They have inspired countless artists, writers, and movie makers. While most horses serve as entertainment and companionship in the age of technology, there are still places where horses are essential for agriculture and transportation. ilovehorses.net celebrates the relationships between people and horses and the influence these majestic animals have had on art, history, movies, and everyday life. You’ll find articles about everything from the science of breeding to the most impressive horse statues in the world, from the biggest horse heroes on TV to the tiniest miniature hinnies. Kristin with Khemosabi on his 29th birthday. I’m a horse lover near Sacramento, CA. I grew up in the Midwest around Appaloosas, Quarter Horses, Paint Horses, drafts, and Arabians. 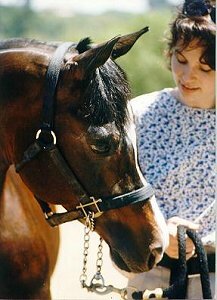 I worked in the Arabian media in the 1990s, including being an editorial assistant to Denise Hearst at Arabian Horse World magazine, but left the business after being discouraged by rampant horse abuse and corruption, especially at Arabian shows. I returned to working in the (non-horse) business world in marketing, publishing, and web development. On the technical side, I began designing websites for clients in 1996, well before blogs or CMS and during Ebay’s infancy. I worked at two now-defunct dotcoms, built an intranet site with five other co-workers to meet the needs of 10,000 Intel employees, and created my own online publication, Arabian Horse Interactive, where we coded everything by hand. Now I’m a mom, writer, desktop publisher, marketing consultant, and very occasionally, artist. 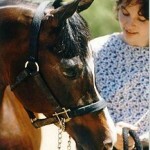 ilovehorses.net is the culmination of all I’ve learned and loved about horses throughout my life. I look forward to more adventures learning about my favorite animal. ilovehorses.net is a blogazine dedicated to everyone who loves horses, whether you’re a breeder, owner, exhibitor, model horse collector, equine art collector, or simply an admirer. If you’d like to submit an idea for an article, please fill out the comment form below.